Source: CICH graphic created using data adapted from Statistics Canada, Environment Accounts and Statistics Division, Households and the Environment Survey, 2009. http://www.statcan.gc.ca/pub/11-526-x/11-526-x2011001-eng.htm – accessed March 12th, 2017. 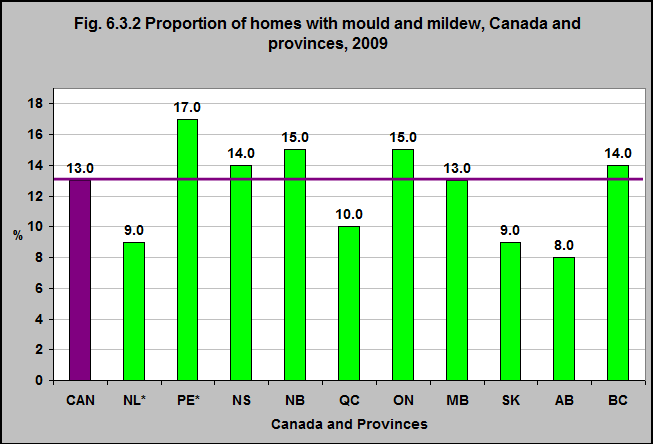 In 2009, 13% of Canadians reported the presence of mould or mildew in their home. That proportion varied from 8% in Alberta to 17% in Prince Edward Island.